Pjcol Ross is an ancient autochthonous Lambrusco vine, cultivated in Val d’Enza for decades. It is not very productive (50/60 quintals per hectare) and when the viticultural production became more intensive and the cultivation modernized, Pjcol Ross was slowly set aside in favor of more productive vines and almost completely disappeared. 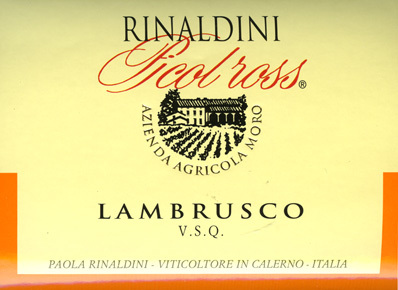 When the current owner’s father, Rinaldo Rinaldini, bought our estate, there was also a small vineyard, in which he found some plants of Lambrusco Pjcol Ross among the other vines. Following grandfather’s advice (whose nickname was “Moro”), the winery ran trials in order to make a varietal wine, finally achieving surprisingly good results. Slowly they obtained new plants and expanded its cultivation, until they had a large enough production to make a varietal wine out of this endangered vine. Over the years, and with many experiments, the Rinaldinis managed to make it with the traditional Metodo Campenoise for best results. Deep red in color. Complex aroma of fresh red fruit on the nose. Dry, straightforward, and full-bodied on the palate with ample tannins on the finish. Pairs well with all Emiliana cuisine, red meats, first courses with red sauces, roasted pork, ostrich, and fish soup. Temperature-controlled fermentation “in rosso” on the skins. Bottled in late winter. Second fermentation naturally in the bottle with formation of sediment. Remains on the yeasts for a minimum of 12 months with attentive riddling.